A GPS week rollover will occur at the end of the GPS day on April 6, 2019. Because the GPS message structure broadcasted by the satellites defines the week as at a 10-bit value, the GPS messages will indicate that the week has changed from 1023 to week 0. Trimble has performed tests using a GNSS simulator to verify that the receiver firmware of our Mapping & GIS handhelds and receivers correctly handle the week rollover in different scenarios. To prepare for the week number rollover, it is recommended to install the latest receiver firmware version available on the Trimble GIS web page under the Support & Downloads section of the relevant product page, or by visiting Support A-Z for legacy products. 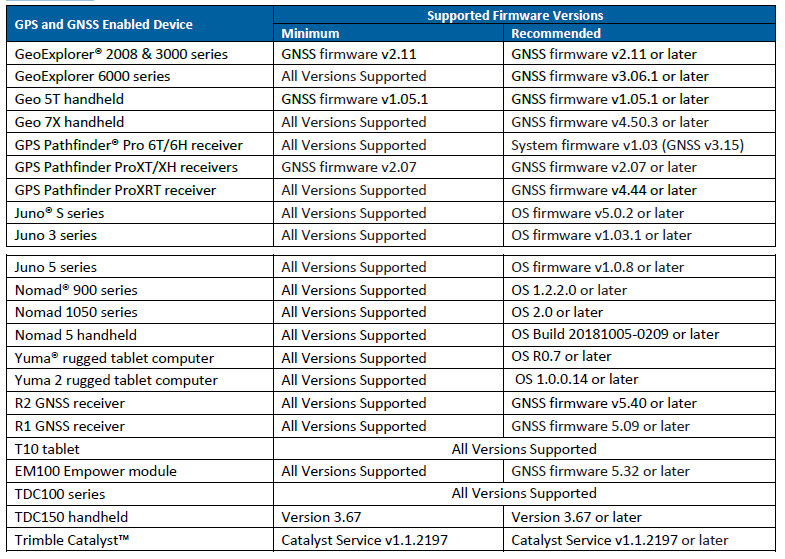 The table below shows the Trimble Mapping & GIS portfolio receivers and handhelds (released 2005 and beyond) that will continue to operate normally following the WNRO event, provided that the receiver firmware version is up to date. Please note that the Geo 5T, GPS Pathfinder ProXT, GPS Pathfinder ProXH, TDC150, and Trimble Catalyst all require the minimum version documented in the table below to continue to function properly after the WNRO event on April 6, 2019. As you may have noticed the 2003 and 2005 Geos are not on the list. After the rollover date, these devices will start reporting dates in 1999.